Periphyton, attached algae at the boundaries of freshwater environments, plays important ecological roles as the base of many aquatic food webs and as an indicator species (Figure 1). In order to better understand processes affecting periphyton, a UC Davis TERC Ph.D. 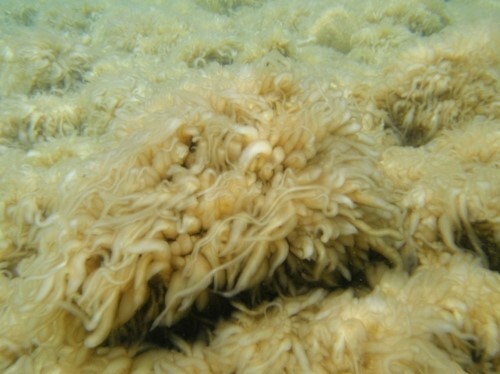 Candidate, Karen Atkins, is building a one-dimensional periphyton biomass model (PBM). 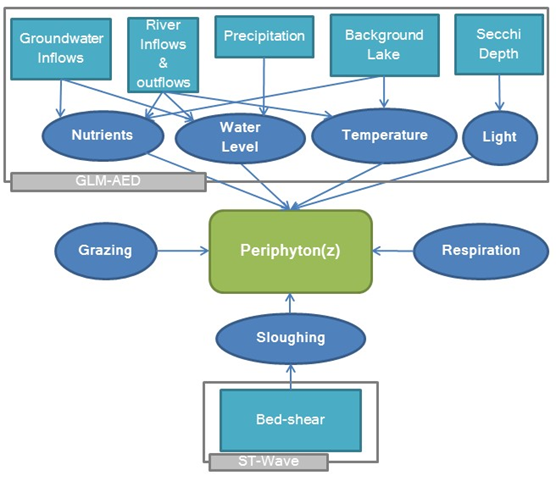 The model uses physical, chemical, and biological inputs to understand the combined influences of light, nutrients, grazing, sloughing, and respiration on periphyton (Figure 2). A periphyton monitoring data set is used to calibrate and validate modeled biomass for periphytic diatoms, blue-green algae, and Charophytes. To simplify use, the PBM is built to pair with the output of commonly used one-dimensional hydrodynamic and chemical models such as GLM-AED and DLM-WQ. Once calibrated and validated, PBM can assist managers to better understand the driving forces of periphyton growth in their system. For example, model runs can simulate the effect of reduced specific nutrient influx rates on periphyton biomass or model a change in periphyton biomass under climate change conditions.